We all take bicycles for granted these days. Most of us remember that exciting Christmas morning or birthday when we were greeted with a bike, rushing to get dressed and out in the street on it. Perhaps you even remember your stabilisers coming off, mum or dad running alongside, gripping the saddle, then suddenly you look round and you are cycling all by yourself! Maybe your bike had a shiny bell to ring, or a basket on the front. Regardless of the type of bike you had, I’m sure most of you agree that some of our favourite childhood memories involve cycling around with friends. As parents and grandparents, teaching your little one to ride a bike is a milestone we all enjoy reaching. This year is the 200th anniversary of the bicycle with the first verifiable practically used bike being invented in 1817. Our feature this month looks at how one of our favourite modes of transport has developed over the years. The very first bicycle that can be verified was invented in 1817 by Baron Karl von Drais, a German civil servant to the Grand Duke of Baden. 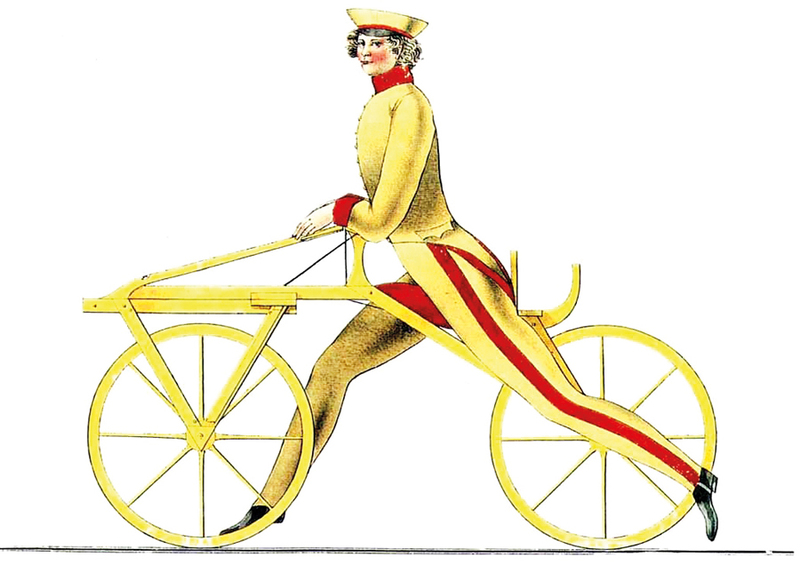 His Laufmaschine (running machine) was known as a Draisine in English and was the first two-wheeled, steerable, human-propelled machine to be commercially successful. The Draisine was driven by ‘scooting’ your feet along the floor – much like a toddler today on a scoot along car. It was nicknamed hobby-horse and made mainly from wood with brass bushings and iron shod wheels, weighing in at 22kg. Drais’ first reported ride was on June 12th, 1817 and he covered eight miles in less than an hour. It is said that Drais became interested in developing an alternative method of travel to the horse because the crop failure of 1816 (known as The Year Without a Summer) caused the starvation and death of many horses. The Draisine proved popular with daring men and several thousand copies were made to be used in Europe and North America. After increasing numbers of accidents however, some city authorities began to ban their use and as a result popularity rapidly faded. The Draisine inspired other people to develop the concept of the bicycle, particularly British cartwrights. One such person was Denis Johnson from London who announced an improved model in 1818. It was more elegant than the Draisine, sporting a more serpentine shaped frame which allowed for larger wheels without raising the seat. During the following summer, it became the latest craze in London society and became known as the ‘dandyhorse’ after the ‘dandies’ who were seen dashing about on them. The fashion for them ended surprisingly quickly due to the speed in which riders wore out their boots, and the two pounds fine many received for riding them on the footpaths. From the 1820’s, many three and four wheeled human-powered vehicles were developed and came in a variety of designs using treadles and hand-cranks to power them. They often were too heavy to be practical, so did not prove greatly popular. Kirkpatrick MacMillan, a Scottish blacksmith is the person who some accredit the creation of the first mechanically propelled two wheeled vehicle in 1839. It is claimed that his design used mid-mounted treadles connected to a rear crank, creating a rear-wheel drive bicycle. The first ever recorded cycling traffic offence reported in a Glasgow newspaper back in 1842 is also rumoured to be perpetrated by MacMillan, although there is no real proof it was him. The report states an ‘anonymous gentleman from Dumfries-shire bestride a velocipede of ingenious design knocked over a pedestrian in the Gorbals and was fined five British shillings.’ The report does not state how many wheels the velocipede in question had, and it is also far more likely that MacMillan would have been referred to as an artisan rather than a gentleman so some feel that the link to him may have been faked by his son. 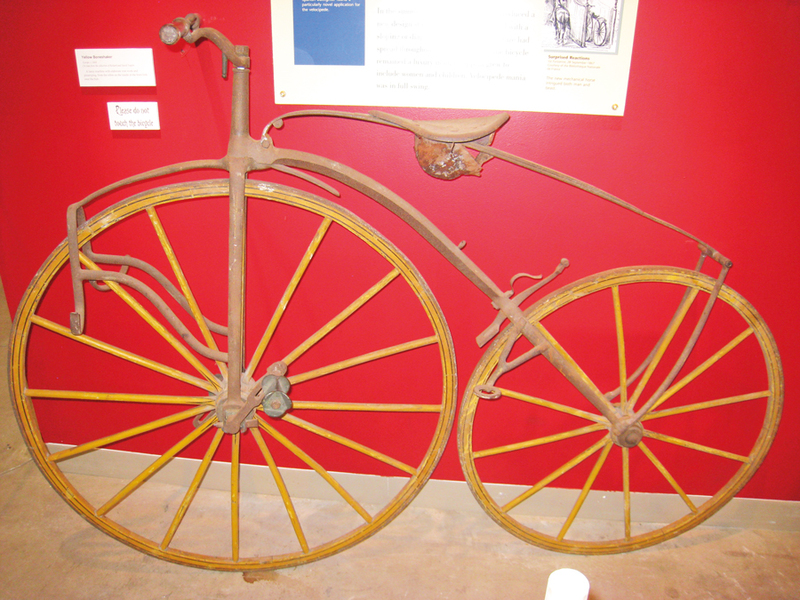 Around 1863 a French design using pedals mounted to the front wheel became the first commercially successful design. The use of metal frames reduced the weight, produced more elegant styling and meant they could be easily mass produced. The new pedals meant that riders could easily achieve higher speeds although it was difficult to pedal the same wheel which was used to steer. There were also stability and comfort problems due to iron banded wheels and the rigid frame. This earnt the name here in England of the ‘boneshaker!’ Later improvements included solid rubber tyres. Despite the expense of these velocipedes, they grew in popularity both in Europe and the USA and Canada. By 1868-69 there were velocipede rinks and riding schools where people could learn to ride safely. The UK was the only country where the bicycle never really fell out of fashion. The Franco-Prussian war in 1870 ended the craze in France, and in the USA it didn’t last long either – possibly due to the poor roads over there making it too difficult to ride. 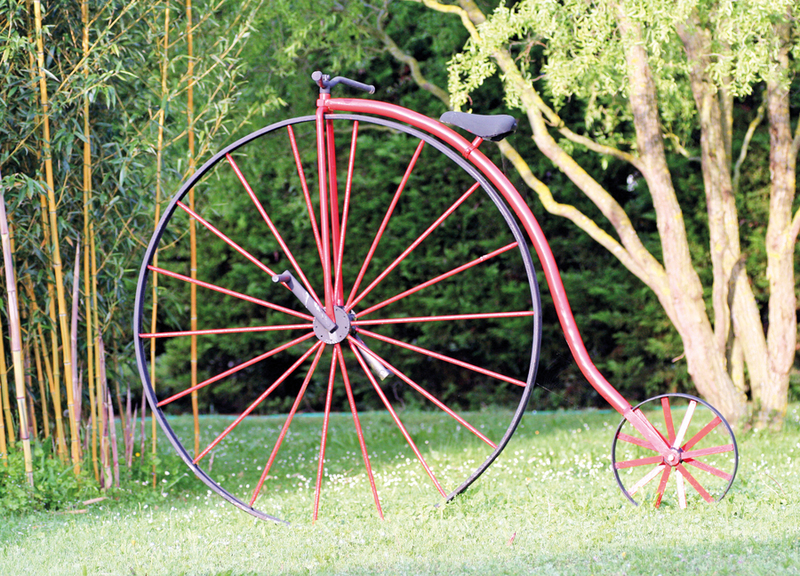 Probably one of the most iconic designs in history, the Penny-farthing is recognised instantly. It was a natural progression from the boneshaker as the larger front wheel allowed for much higher speeds while the small rear wheel kept weight down. Eugene Meyer, a Frenchman is regarded as the father of the ‘high bicycle’ as he invented the wire spoke tension wheel in 1869, producing the high bicycle design until the 1880’s. Here in Britain, James Starley is regarded as the British cycling industry father. He added tangent spokes and a mounting step to his bicycle named ‘Ariel’. Solid rubber tyres and hollow steel frames reduced the weight even further and improved riding comfort. The size of the front wheel depended upon the length of the rider’s leg, but could have a diameter of up to 60in. The nickname ‘Penny-farthing’ was given as the penny represented the large front wheel, and the farthing the small rear wheel. These new machines were incredibly fast, but highly dangerous. A rider travelling at high speed up in the air only had to hit a small snag in the road and be thrown over the front wheel. ‘Taking a header’ was all too common, often resulting in two broken wrists in an attempt to break a fall, or even sometimes death. This meant the Penny-farthing was generally only popular with young men. Older gents preferred the tricycles and the bicycles were also inaccessible for women. The high bicycles were generally manufactured in Coventry, Oxford, Birmingham and Manchester where already established sewing machine industries meant that the cities had the appropriate metalworking and engineering skills. 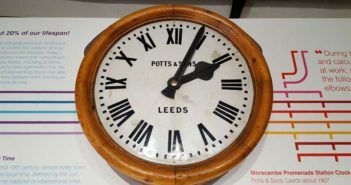 They found their way across the English Channel by 1875, and two years later were starting to be exported to the USA. 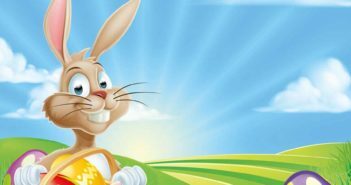 Popular with the upper-middleclass citizens of all three countries, they spread to the rest of the world across the extent of the British Empire. As the name suggests, the development in the late 19th century of the safety bicycle shifted public perception of cycling from a dangerous hobby for young men, into a safer and more accessible mode of transport for both men and women of all ages. Because of this, it can be argued that this was the most important change in the history of the bicycle, making them as popular as they are today. Attempts were made to create a rear-chain-driven bicycle to solve limited top speeds and the huge size of the front wheel. Harry John Lawson’s design in 1879 was one of the first but failed as it still had a huge front wheel. It was called the ‘Crocodile’ by critics at the time. The first successful attempt was produced in 1885 by John Kemp Starley, (nephew of James) and was named the ‘Rover.’ It had equal sized wheels with a steerable front wheel, and rear chain drive. The safety bikes completely replaced high wheelers by 1890 after being replicated in North America and Western Europe. The smaller wheels did create some comfort issues, but John Dunlop’s creation of the pneumatic bicycle tyre in 1888 solved the problem. Along with improved speed and comfort, the rear wheel drive enabled a smoother injury free ride as transferring the pedals from the front wheel meant that a rider could turn corners much easier. Upper and middle classes loved the safety bicycle, and as the first one ever to be suitable for women, American feminist Susan B Anthony called it the ‘freedom machine.’ She said “Let me tell you what I think of bicycling. I think it has done more to emancipate women than anything else in the world. 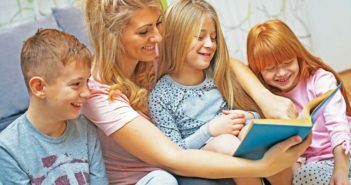 It gives women a feeling of freedom and self-reliance. I stand and rejoice every time I see a woman ride by on a wheel…the picture of free, untrammelled womanhood.” The bicycle craze also helped liberate women from the fashions of long, voluminous dress, calling for more rational and unencumbering garments. As the 19th century ended, the bicycle had become an important mode of transportation and increasingly popular as a form of recreation. 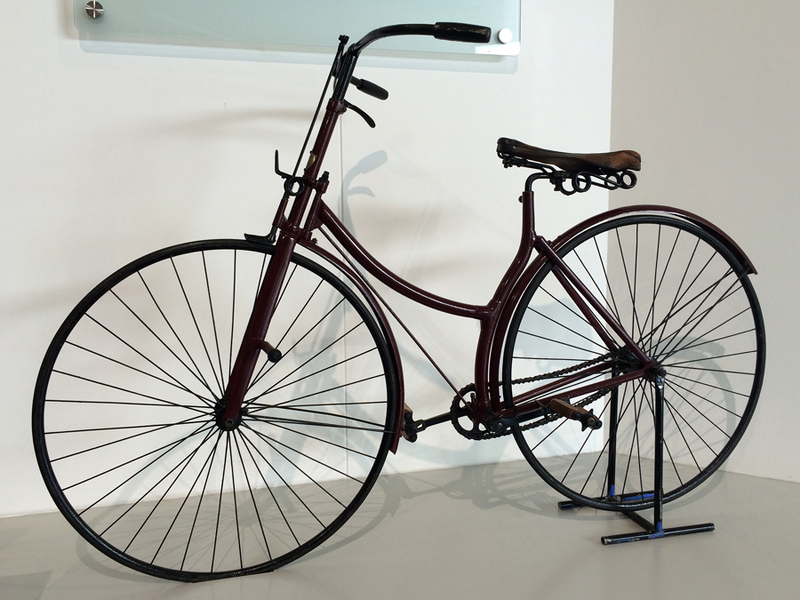 Adolph Shoeninger created the ‘Crescent’ bicycle using mass production and stamping methods. This meant that they became much more affordable for normal working people. Over the first half of the 20th century, cycling became increasingly more important in Europe, whilst in America they declined as automobiles became the more popular choice. During the 20’s they became considered more for children, with most bikes in the USA being made for children by 1940. Meanwhile back here in Europe, despite the invention of motorbikes and cars, they remained mainly an adult activity used for commuting and racing although children’s bikes did appear by 1916. Cycling continued to evolve to suit different needs. In the 30’s, racing organisations in Europe allowed racers to use gears. However, to change gears the rider had to stop to remove the wheel, flip it around and remount it. Despite this, racing times drastically dropped! Bike fashions changed over the century too. Children of the 60’s and 70’s will remember the ‘Chopper’ and racing bikes also became popular as they were more lightweight and affordable. 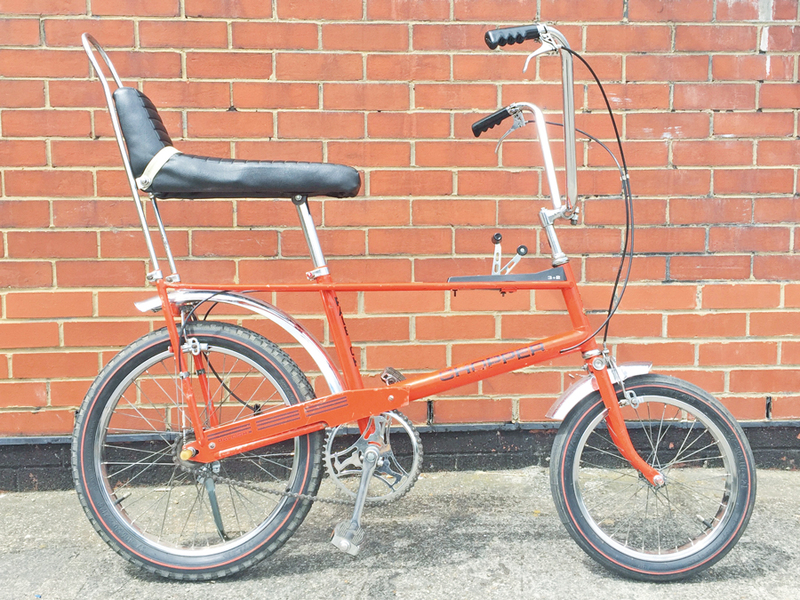 The Raleigh Chopper was a sensation at the time with every child in the country either owning one or coveting one! Its unique features including a frame mounted gear lever, and the high back padded seat were incredibly cool and contributed to the chopper becoming a cultural icon. Although the bike was in high demand, it did have its problems. It was less stable and heavier than other styles, could perform involuntary wheelies and the position of the gear lever contributed to injuries sustained in the frequent accidents on Choppers. Despite their reputation as a somewhat dangerous toy, many adults today still mourn the fact that they were never lucky enough to own one! BMX bikes also made an appearance as teenagers wanted to imitate motocross. The 80’s saw the arrival of the mountain bike. They were designed as all-terrain bicycles for use off-road, but they became the bike every child craved. 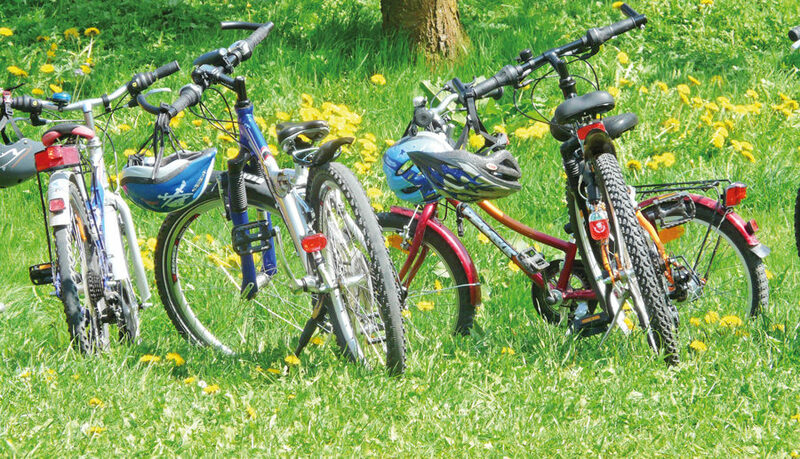 By the year 2000, sales of mountain bikes were far higher than those of other styles. 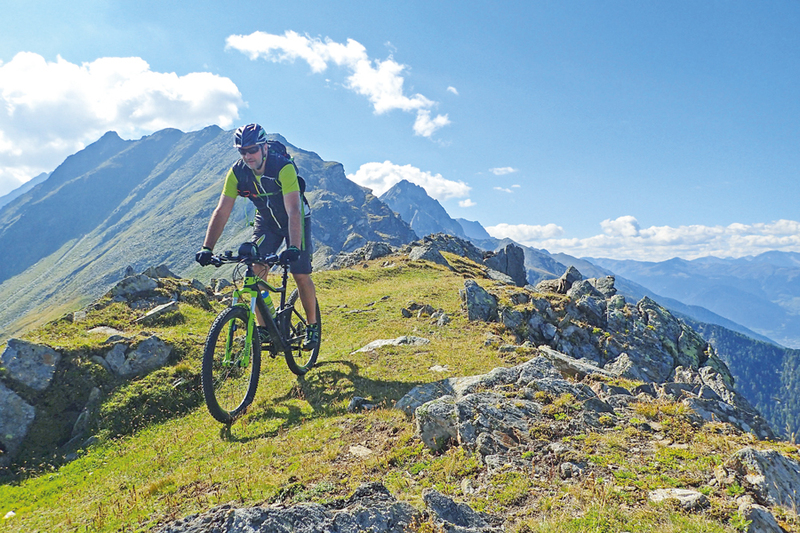 Today, mountain bikes are still popular, and the use of technology means that electric bikes are now on the increase. 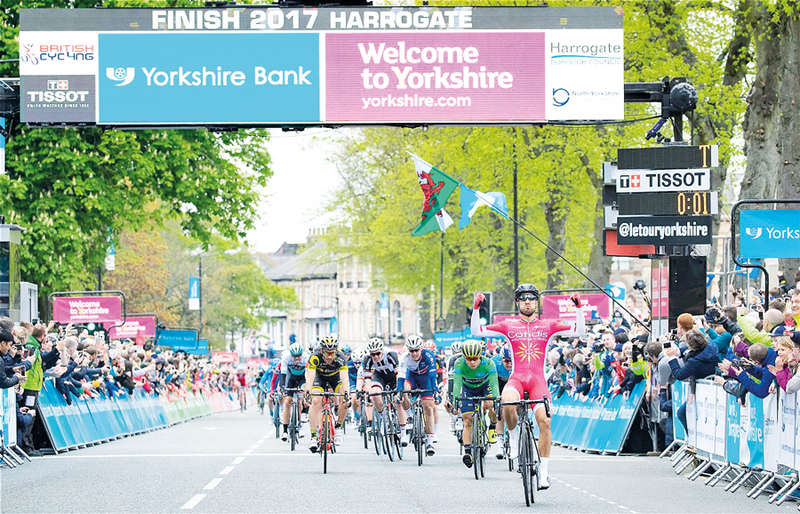 For the last few decades bikes have been mainly used by children and adults for recreation, but major events such as the Grand Depart and the Tour de Yorkshire has boosted the profile of bicycles once more. This, combined with the government working to promote cycling as a greener way to travel and investing in safer cycle lanes means more and more adults are turning back to the bike as a mode of transport for commuting, beating congestion. Surely, bicycles will continue to be part of our lives for many years to come as they have proven over the last couple of centuries to be highly adaptable and above all, enjoyable!